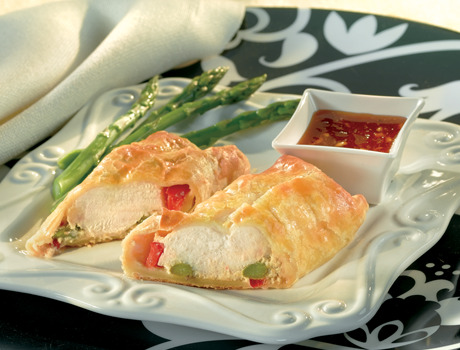 This elegantly presented dish is surprisingly easy to make. 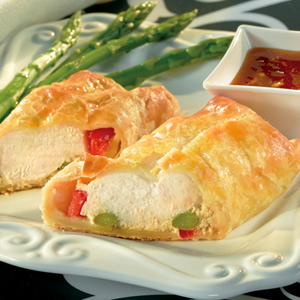 It features tender chicken, colorful vegetables and seasoned cream cheese baked in a golden, flaky puff pastry crust. Unfold 1 pastry sheet on a lightly floured surface. Roll the pastry sheet into a 14-inch square. Cut into 4 (7-inch) squares. Repeat with the remaining pastry sheet. Stir the cream cheese, 1/4 cup preserves, 1 tablespoon soy sauce, 1 teaspoon ginger root and egg yolk in a medium bowl. Spread about 1 tablespoon cream cheese mixture on the bottom third of each pastry square. Top each with about 4 red pepper strips, 2 asparagus spears and 1 chicken breast. Brush the edges of the pastry with water. Fold 2 opposite sides of the pastry over the filling. Starting at the short side with the chicken, roll up like a jelly roll. Press the seams to seal. Place the pastries, seam-side down, onto a baking sheet. Brush the pastries with the egg mixture. Bake for 20 minutes or until the chicken is cooked through and the pastry is golden brown. Let the pastries cool on the baking sheet on a wire rack for 5 minutes. Heat the broth, remaining preserves, soy sauce and ginger root in a 1-quart saucepan over medium heat for 5 minutes or until the mixture is hot and bubbling, stirring occasionally. Serve the sauce with the chicken.